Neil Nitin Mukesh and his wife Rukmini Sahay welcomed their first born in September 2018 and named her Nurvi. 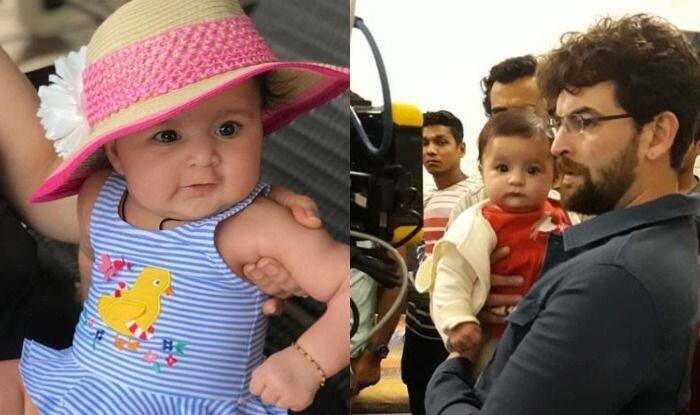 She is now four months old and on the occassion, he has shared a picture of his little munchkin accompanying him on the sets of Bypass Road that will melt your heart. Earlier today, Neil took to his Instagram to share a picture of his little one and captioned it, “So someone who is celebrating her 4th month has come to see her papa work on the sets of “Bypass Road “ in Alibaug, while she herself is busy posing for the paparazzi 珞.” His daughter accompanied him to the sets and the picture is just too adorable to handle. One can see Nurvi posing for the paparazzi which led Neil mention it on his post. Neil has flooded his Instagram with Nurvi’s pictures and the stills are prove that he is very possessive of his daughter and cannot get enough of her. He shared the first picture of Nurvi on September 23 and captioned it, “NOW EVERYDAY IS DAUGHTERS DAY.” Post that he kept on uploading her snaps on social media. From Diwali to Christmas, he kept his fans updated with how he celebrated all the occasions with his first born. Neil and Rukmani tied the knot last year in Udaipur. Their wedding was attended by close friends and family. The family threw a grand reception in Mumbai that was attended by many Bollywood celebrities. On the professional front, Neil will next be seen in his younger brother Naman Nitin Mukesh’s directorial debut, Bypass Road. The film will also star Adah Sharma, Gul Panag and Rajit Kapur in pivotal roles. Neil is known for his films like Johnny Gaddaar, New York, David and 7 Khoon Maaf.